Washington senior Kassidy Hines brings the ball upcourt, guarded by Chillicothe’s Emma Barnes during a Frontier Athletic Conference game at CHS Wednesday, Jan. 16, 2019. 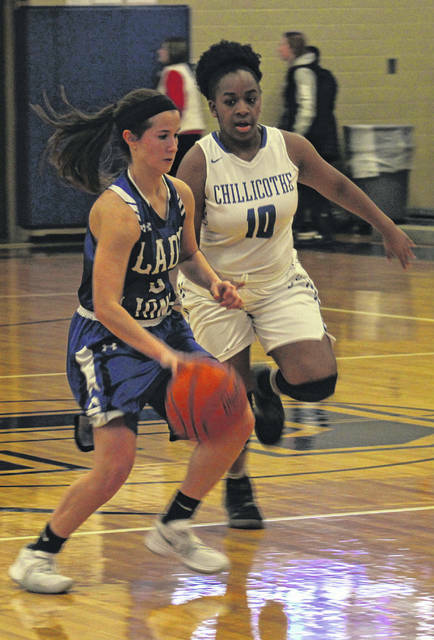 CHILLICOTHE — The Washington Lady Blue Lions visited Chillicothe Wednesday for a Frontier Athletic Conference game against the Lady Cavaliers. After a close first quarter, the Lady Lions pulled away and went on to post a 53-24 victory. Washington improves to 7-0 in the FAC, 11-4 overall. Chillicothe falls to 4-11 overall, 2-4 in the FAC. Washington had two players in double figures with junior Rayana Burns leading the game with 17 points. She also had five rebounds, and led the team with four assists, two steals and two blocked shots. Senior Hannah Haithcock scored 13 points and had four rebounds and freshman Jeleeya Tyree-Smith scored six points. Junior Shawna Conger had five points and led the Lady Lions with seven rebounds. Shawnice Smith led Chillicothe with six points. Meliah Johnson had five and three players scored four points each for the Lady Cavs. “We have two players who have started for us this season who were out tonight due to illness,” Washington head coach Samantha Leach said. “Maddy Jenkins started for us this evening and did a great job; and Kassidy Hines, both of them had great effort on both ends of the floor. Washington’s next game is scheduled to be played Saturday at Jackson beginning at noon, weather permitting. WASHINGTON — Rayana Burns 7-3-17; Bre Taylor 2-0-4; Kassidy Hines 1-2-4; Shawna Conger 1-3-5; Maddy Jenkins 2-0-4; Hannah Haithcock 2 (3)-0-13; Abby Tackage 0-0-0; Aaralyne Estep 0-0-0; Jeleeya Tyree-Smith 3-0-6; Haven McGraw 0-0-0. TOTALS — 18 (3)-8-53. Free throw shooting: 8 of 16 for 50 percent. Three-point field goals: Haithcock, 3. CHILLICOTHE — Zoe Ford 1-2-4; Makenzie Greene 0-1-1; Julia Hall 0 (1)-1-4; Emma Barnes 0-0-0; Emma Ward 0-0-0; Aries Barnes 0-0-0; Alysssa Cunningham 1-2-4; Shawnice Smith 3-0-6; Hayden Price 0-0-0; Meliah Johnson 1 (1)-0-5; Olivia Johnson 0-0-0. TOTALS — 6 (2)-6-24. Free throw shooting: 6 of 14 for 43 percent. Three-point field goals: Hall, M. Johnson. In the junior-varsity game, Washington defeated Chillicothe, 31-14 to improve to 10-2 overall. Jeleeya Tyree-Smith and Haven McGraw shared high scoring honors for the game for Washington, each with 10 points. Mia Moats scored seven and Aaralyne Estep scored four. Emma Fromm led Chillicothe with five points. Washington is scheduled to play at Jackson at noon Saturday, weather permitting. WASHINGTON — Aaralyne Estep 2-0-4; Mia Moats 2 (1)-0-7; Arianna Heath 0-0-0; Abby Tackage 0-0-0; Haven McGraw 5-0-10; Jeleeya Tyree-Smith 4-2-10. TOTALS — 13 (1)-2-31. Free throw shooting: 2 of 4 for 50 percent. Three-point field goal: Moats. CHILLICOTHE — Emma Ward 0-0-0; Taylor Simmons 1-1-3; Karis Crawford 0-0-0; Shayla Beard 0-0-0; Abbee Wade 0-0-0; Meleah Beverly 0-0-0; Emma Fromm 2-1-5; Emma Barnes 2-0-4; Olivia Johnson 1-0-2; Jyle Harris 0-0-0; Shay Miller 0-0-0. TOTALS — 6-2-14. Free throw shooting: 2 of 4 for 50 percent. Three-point field goals: none.